لقد صرح وزير الهجرة والتوطين الأسترالى "سكوت مورسون " وقال " سيكون بيننا ما يقارب 500 لاجئ سورى الى الأراضى الأسترالية خلال عامى 2013 / 2014 " . ومن المحتمل وفقا لأخر احصائيات ادارة الهجرة والجنسية بأستراليا IMMI ان يصل عدد اللاجئين السوريين الذين تم اصدار حق اللجوء لهم الى أستراليا مايقارب 1000 لاجئ من مقدمى طلبات اللجوء الى الأراضى الأسترالية . A further 500 Syrian refugees will be settled in Australia under the government's strengthened humanitarian programme which guarantees more resettlement places for those waiting in desperate circumstances around the world, Minister for Immigration and Border Protection Scott Morrison announced today. A decision on granting additional places to Syrian refugees was flagged at the government's Operation Sovereign Borders briefing on September 30. Australia's commitment is in response to the UNHCR's call for coordinated international efforts to resettle Syrian refugees. 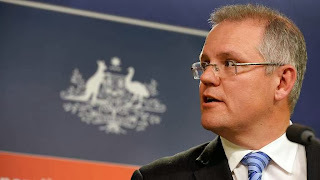 'The Australian Government will work with the UNHCR to identify those offered the resettlement places, which will be targeted for highly vulnerable people in urgent need of protection,' Mr Morrison said. Resettlement will commence in 2013-14. 'The government's policy of denying permanent visas to those who arrived illegally by boat will enable Australia to continue offering targeted resettlement to those most in need,' the Minister said. 'Australia will also continue to assist the UNHCR in the internationally coordinated response to the Syrian crisis. 'Australia has so far provided more than $100 million in humanitarian assistance to the Syrian crisis, including $45.5 million to support humanitarian activities in countries neighbouring Syria. 'Our funding has supported UNHCR and other agencies to provide shelter, food and clean water to refugees and host communities. 'Australia has long supported the resettlement of genuine refugees through its offshore refugee programme, working in close cooperation with the UNHCR, and will continue to do this. 'The Australian people's generous support should not be interpreted as an encouragement to those seeking to enter our country illegally. 'People who arrive illegally by boat will not be resettled under our humanitarian programme, regardless of their country of origin. 'They will be subject to the policies the government has established under Operation Sovereign Borders,' Mr Morrison said. The government is meanwhile also continuing to progress the issue of humanitarian visas for Afghan interpreters and other locally engaged personnel who have offered crucial support to Australia's personnel serving in Afghanistan. Mr Morrison said further updates would be provided soon. The Arab Immigration & Citizenship Rights Centre Inc. Copyright (c) 2013 . All rights reserved.ArabCan. Powered by TMT.